One year after signature of the technological partnership between VPLP Design and CNIM, Oceanwings®, a new wind propulsion method, is coming to industrial maturity. 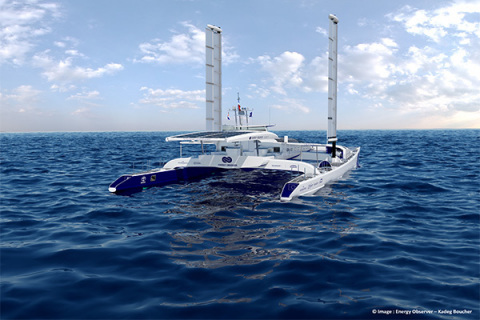 PARIS--(BUSINESS WIRE)--Energy Observer, the first hydrogen-powered vessel aiming to achieve energy self-sufficiency, with zero greenhouse gas and fine particle emissions, has been equipped with Oceanwings® wingsails. 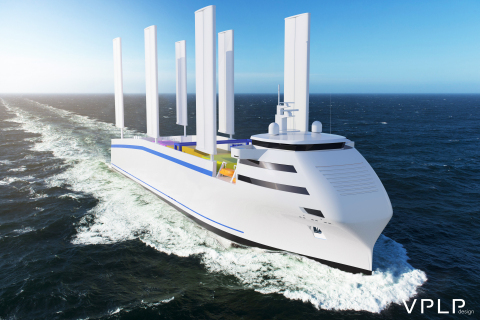 This hybrid propulsion system consisting of a composite mast 12m high and two sails of 32m², will reduce the craft's energy spending. Designed by VPLP Design, Oceanwings® wingsails are jointly developed and manufactured in CNIM's industrial facilities in La Seyne-sur-Mer. Installation of Oceanwings® on board Energy Observer is a first step towards reducing the environmental impact of global shipping. Inspired by the rigid sails of the America's Cup, this technology allows energy savings of between 18 and 42% depending on the vessel. A significant figure when it is recalled that 90% of all world trade transits by sea. Some 50,000 ships are therefore responsible for severe air pollution by rejecting into the atmosphere pollutants such as fine particles, and oxides of nitrogen (NOx) and sulphur (SOx). At the end of 2017, CNIM and VPLP Design signed a technological partnership agreement for design and manufacture of the Oceanwings® propulsion system. The partnership took up the challenge of designing a product suitable for industrial production. The Oceanwings® wingsails have now reached maturity, with the first two being integrated in the Energy Observer vessel. CNIM has brought its expertise as an equipment manufacturer and industrial contractor to ensure that the Oceanwings® design meets the technical and industrial challenges of mass production. "We offer an industrial product with high added value that meets not only the performance levels expected by our customers but also the economic constraints imposed by the market," says Philippe Lazare, chief executive of CNIM's Industrial Systems Division. "Oceanwings® wingsails will undoubtedly find their place in fields as diverse as recreational sailing, yachting, maritime transport (bulk carriers, chemical tankers, oil tankers, etc.) and offshore fishing," says Marc Van Peteghem, joint founder of VPLP Design.